Durga puja is just days away and everybody is happy to welcome Maa Durga and celebrate the 9 days. Kolkata is famous for it’s Pujo as the whole state of Poschim Bongo will indulge in the festivities. This year MTS Kolkata has brought a new way to celebrate Pujo. And that’s online. YES. 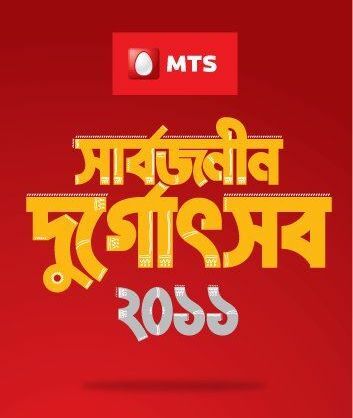 MTS has created a whole new website where you can have the look and feel of Pujo, that too being online. MTSPujo.com is the site where you can have a complete 3-D thematic pandal and a walk through to it with the virtual replica of the 6 gods and goddesses, their 5 vahanas and Mahish Asura. Even the Puja rituals will be conducted online starting from Mahalaya. The website is being popularized through social networking sites, and over Facebook you can ever be friends with Maa Durga, who now has nearly 700 friends. And not to forget the villain Mahish Asura. Yes he is also up there on Facebook and can be you friend. “The basic objective of the campaign is to integrate the Bengali community living in India or abroad on the occasion of their biggest festival Durga Puja. To provide them with an online platform where they can interact with each other and share their Puja experiences, upload photos and videos etc. So Bengalis be it in Maddox Square or Manhattan will get to experience the best of both worlds.” said Keshhav Tiwary, COO, Kolkata & West Bengal circle.